Why would you need to upgrade the master cylinder? When you upgrade to larger brake calipers your brake pedal movement may increase because more brake fluid has to be moved to power the bigger (or more) pistons. Upgrading to the Mazda 929's master cylinder (MC) can bring the pedal movement and feel back to stock (or better than stock). The stock master cylinder is 15/16" in diameter, the 929's is 1" in diameter and about 1/4" longer. That 1/16 of an inch larger piston pushes quite a bit more fluid. After I did this mod my brake pedal was firmer and it required less pedal effort to lock the brakes. I'm very happy with this upgrade. The only difficult part of this mod is the fabrication of two 12 inch lengths of brake line which can be done pretty easily if you have a pipe cutter and pipe double-flare tool. You can always take the 929 master cylinder to a brake shop and have them fabricate and install the brake lines. You can do everything else and save some cash. Master cylinder comparison. 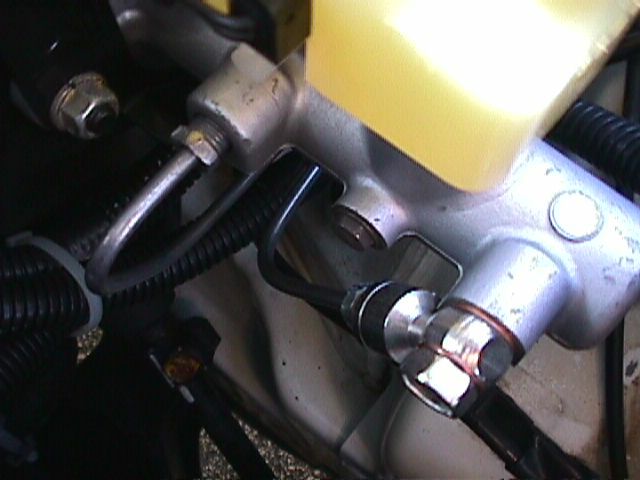 The rear brake line connector on the 929 MC is designed for a flare fitting, not a banjo bolt like the RX-7 MC. A 93 Mazda 929 master cylinder part # HG31-43-400G (ABS version) - I got mine from Jeff Haas Mazda for $170 (that's a 25% discount for ordering from their 800 number: 800 233-2991). Pep boys wanted $214 for it. Mazda Competition Parts will sell it for $135 if you are a qualified racer. You also need a 929 MC metric flare nut, the MC comes with the banjo bolt, but you need a flare nut for the rear MC brake line connector. Do not attempt this modification yourself unless you are a very competent mechanic. Two short brake lines will have to be fabricated and a single point failure in the brake system will result in the total loss of brakes and possible damage/injury/death! 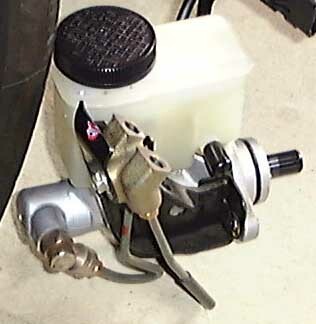 A brake shop can fabricate the brake line and hook it up to the new master cylinder. Before you remove any of the brake fittings, carefully clean all around them, so that dirt can't get into the system as the fittings are opened. Start by putting some rags below the master cylinder (hydraulic fluid will bubble and peel your paint very quickly). I recommend getting a pack of various size vacuum plugs for this purpose. I put plugs on each of the two brake lines and one on the hydraulic clutch connection to prevent excess fluid drippage. Use a 10mm flare nut wrench which is the SST (Special Service Tool) the RX-7 Workshop Manual calls for to loosen the brake lines that go into the double brass fitting next to the filler cap (item C in the first diagram above). I highly recommend you buy a $4 10mm flare nut wrench (the SST mentioned above). It has a wider jaw to keep you from rounding off the nuts and its length will help you torque the brake fittings properly (it's hard to do with a 5 inch long 10mm wrench). 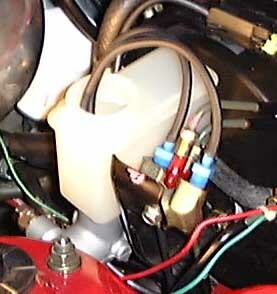 By disconnecting the brake at the brass double fitting, very little fluid will drip out. I put vacuum hose caps on the brake lines once I got them loose. Remove the two nuts that hold the MC to the brake vacuum chamber. Remove the large vacuum line running to the vacuum chamber to relieve the vacuum pressure and remove the MC. If you don't release the vacuum you will have trouble getting the MC out. You'll have to swap the master cylinders' reservoirs because the 929's doesn't have an hydraulic clutch connection. Remove the Phillips head screw below the reservoir and pop off both reservoirs and then swap them. Use a little hydraulic fluid on the rubber seals to make the installation of the reservoir easier. Reinstall the Phillips head screw to secure the reservoir. The 929 MC has a fitting for one of the two brake lines on the wrong side (engine side, rather than towards the fender). The rear brake line needs a metric flare nut, the other already has a banjo bolt with a flare fitting installed. Both brake lines on the MC will have to be replaced. I bought two prefabricated, 12 inch long 3/16 inch brake pipes, cut off one end, removed the flare fittings, put on metric flare fittings, bent them over a 2 x 4 railing to get a nice 180 degree bend, cut it to fit with a pipe cutter, put the other metric flare fitting on and double-flared the new pipe. See Photo. 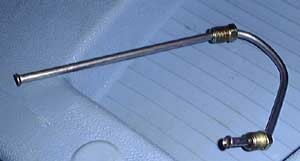 See the Flare a Brake Line How To for instructions on how to double flare a brake line. The rear line runs straight out from the rear flare fitting a couple inches and bends down and under the MC, coming up to the brass junction block. Make sure the lines don't rub the MC or its support. Connect the new brake lines and torque the connectors to 113 to 190 inch pounds (10 to 15 foot pounds). I highly recommend this procedure--if you bleed your master cylinder you will minimize the amount of air you push through the brake lines and ABS. If you don't do this you may have a really tough time (and use lots of brake fluid) getting the air out of the brake system (you may suffer a spongy brake pedal for years!). This procedure is well worth $10 and a little time. I got my master cylinder bleeding kit at Mechanics Auto Parts, HELP! part # 13999, Metric Master Cylinder Bleeder Kit, $9.49. The kit consists of several plastic fittings and rubber hose. Mount the master cylinder in your car by securing the two nuts and connecting the hydraulic clutch line but don't hook up the brake lines yet. 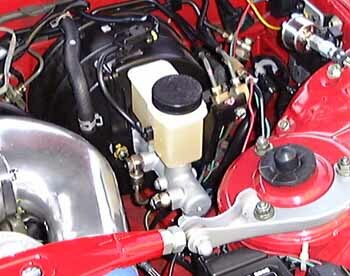 Screw the correct size bleeding kit fittings into the two line connectors at the double brass pipe fitting and run the hose from the fittings up into the master cylinder reservoir (the fluid loops around from the master cylinder's outputs back into its reservoir). See photo above. Fill the MC reservoir with brake fluid and pump the brake pedal until you don't see any more bubbles coming out of the hoses. It took me about 5 minutes of pumping. Remove the bleeding hoses one at a time and hook your brake line up quickly so you'll limit the amount of fluid that runs out. Torque the brake lines to 113 to 190 inch pounds (10 to 15 foot pounds). Bleed the brake system and do a pressure check. I had very little air in the brake system, the MC bleeding worked. See the Brake Bleed How To. My brake pedal is firmer now and there is less pedal travel than with the stock MC. Be careful during your test drive, your brake vacuum will take about 30 seconds to replenish itself. Good luck. I didn't do this because the piston extension of the 929 MC was exactly the same as the extension of my stock MC and of course I didn't have the three Special Service Tools (SST) to do it by the book. My brakes work great without the adjustment. The RX-7 Workshop Manual describes the procedure on page P-12. It shows three SST's being used. I scanned in the images from the manual as best I could. A little history... A few months back, a prototype Cooltech brake system was installed in Project RX-7. Our goal was to play around with different systems and see which set up worked the best. Our first system consisted of 14x1.1" Metal Matrix Composite (MMC) rotors with Porsche/Brembo calipers (from rear of 993 turbo). FYI, MMC rotors are approx. 70% lighter than traditional iron rotors. They also dissipate heat up to 5 time as fast, according to Cooltech. Although much larger, and probably far stiffer, than the stock 4 piston calipers, the Brembo caliper had smaller pistons. This greatly reduced pedal travel (which was good), but reduced the clamping force of the system (which was bad) at a given pedal pressure. In fact, with this set up, the stock rear brakes would do more work than they should. Once ABS kicked in, it behaved as an electronic proportioning valve, which somewhat masked the problem. Until that point, the car was very loose under braking (needed more front brake). Then we jumped on the other side of the fence: larger-than-stock pistons from the "big red" caliper (even more enormous caliper-from the front of a 993 turbo). We also increased the thickness of the MMC rotor from 1.1" to 1.25". Just barely fit behind the airy spokes of the big 17" TE37s. Around town, this set up was very nice. In fact, pedal travel was very close to stock. Braking force, on the other hand, was exceptional. However, on the track, while braking from high speed, weaknesses became apparent. It almost felt as if there was air in the system-it took two quick pumps to get the characteristically firm pedal it had when driven on the street. Repeated brake bleeding did not help. Thanks to Jim O'Brian for the 929 MC upgrade info!